There are many reasons I’ve wanted to feature suffragette books on the blog for a while now. In a world of current political turmoil, it can be helpful to look to historical fiction for guidance. Women’s rights are still an issue, with recent contention over equal pay, sexual harassment in the workplace, and ongoing struggles within families as to ‘default’ parenting. So, the women’s fight for suffrage has never seemed that far from one’s mind. Next year, attention focusses fully on this again, as Vote 100 aims to bring attention to the 100th anniversaries in 2018: The Representation of the People Act 1918 (allowing some women to vote for the first time) and the Parliament Qualification of Women Act in 1918 (allowing women to stand for election to the Commons) as well as many other anniversaries. However, my compelling reason for bringing you these ‘suffragette books’ is that they’re all so completely brilliant. 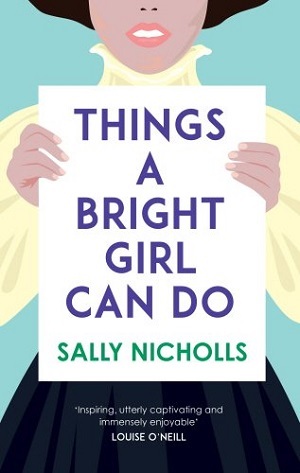 One of my favourite authors for middle grade, Nicholls tells a wonderful yarn no matter her subject matter, and here she steps completely into YA territory. This accomplished novel follows three girls, Evelyn, May and Nell, through their fight for the vote at the beginning of the First World War. Each girl is from a different social strata of society, (Evelyn is expected to marry rather than be educated, and Nell is a working class girl just trying to get by), and each has different aims and ambitions, as well as winningly flawed yet determined personas. Nicholls tackles social history with aplomb, as well as LGBT issues and the tangled emotions of suffragette women as their cause became swept up in the war breaking out across Europe. Both a fascinating historical eye-opener and a scintillating story, readers will race through the different points of view to see how the girls’ stories collide, and where they each end up. The research shines through, but never overpowers the book, and it is the girls who in the end dominate and succeed – through hardship and tears. Characters to remember, prose to devour. Who wouldn’t give these girls the vote? Buy your copy here. For a younger readership, but another powerful novel that also includes accurate social history of the time (the author borrows from her own school’s history), with a great story. 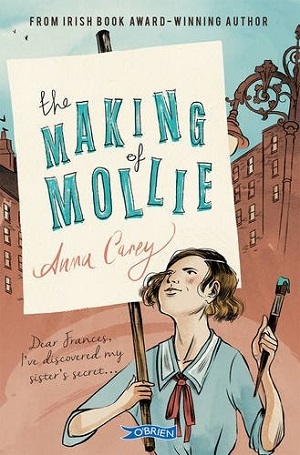 Told in letter format to a friend at boarding school, Mollie stumbles into women’s suffrage after sneaking out after her big sister Phyllis and ending up at a suffragist meeting. Mollie empathises with the cause after relating it to small injustices in her own life, such as the free reign afforded to her brother, and the fact that he’s always given the best bits of the roast chicken first. The story strikes a lovely balance between school days (tussles with friends and enemies, conservative teachers and disapproving adults), with the political cause dominating the landscape. Mollie and her friend take to the suffragette cause in a gentle way; attempting to attend meetings; their most daring venture being the chalking of pavements with notices. It feels real, and practical, and suited well to the age of the protagonist. This novel is set in Dublin rather than England, and also intersperses the politics of suffrage with issues of Irish Home Rule, illustrated by speeches of the time. The book doesn’t shy away from details, but mainly explores a coming-of-age at an interesting political time, showing what it means to stick up for what you believe in, and the consequences for all those involved. Clever, engaging and endearing. You can purchase it here. 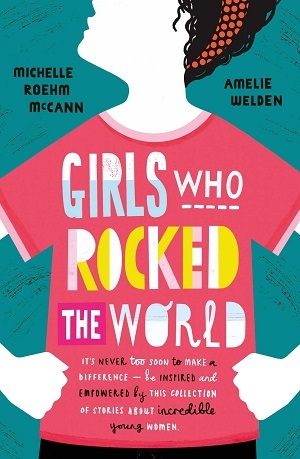 Part of the series of stylish picture books on women achievers; previous titles have included Frida Kahlo, Maya Angelou, Marie Curie, telling the women’s stories simply and effectively. This one is no different. 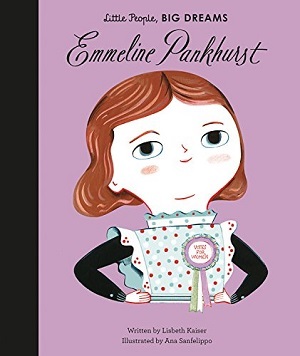 Pankhurst’s life is explained with one or two sentences per page, from her childhood in which she first discovered the inequalities between men and women and then her inspirational fight in adulthood to obtain the vote for women. It highlights her leadership skills, the adversity she faced as a single mother after the death of her husband, and her commitment to her family as well as to the cause. Her life is distilled into a simple, harmless yet powerful biography. With retro colouring, and great attention to detail, the illustrations make the storytelling. There is a find out more section at the back, and photographs of the real Emmeline on a timeline, but the essence of this series is that the books look as good on a coffee table as lining a child’s bedroom. You can buy it here. Cheating a little, because this book isn’t out until January, but this beautifully illustrated title celebrates campaigners around the globe who fought for the women’s right to vote. Although suffrage in this country does get a good deal of attention, there are some startling facts and figures from other countries that are worth knowing, and this book aims to highlight them. In fact, the story starts in New Zealand, with Kate Sheppard, who cycled her way around the streets in Christchurch in 1892. Maori women and female settlers in New Zealand became the first women in the world to win the right to vote in a national election in 1893. The book moves chronologically around the globe, charting the rise of women’s rights country to country, and mentions key campaigners and activists, but also points out places in which women were afforded the vote, but the right was not necessarily granted to other minority groups. Fascinatingly illustrated too, in that the illustrations dominate each page with their bold colours, striking strength and symbolism, and each suits its country well, there is little text for the size of the book – just enough to convey the pertinent points and get the reader thinking. The book ends in 2015 with Saudi Arabia, but also draws some conclusions. The author points out that women have a long way to go in other areas of equality, such as pay, education, and opportunities, and asks the reader to think about the global patterns in which suffrage was granted – often at times of war, revolution, or changes in identity. This is a powerful-looking book for a powerful subject, and well-deserving of a place in every library. You can pre-order your copy here. 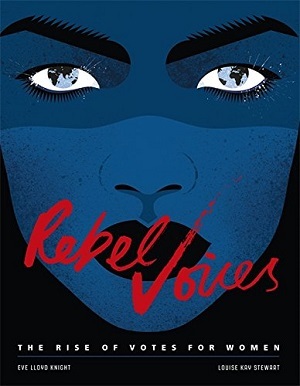 Lastly, this isn’t a suffragette book, but if you’re looking for inspiration on powerful women, as well as Bedtime Stories for Rebel Girls by Elena Favilli and Francesca Cavallo and Fantastically Great Women Who Changed the World by Kate Pankhurst, you’d do just as well (if you’re looking for something aimed at those a little older) to pick up this collection of biographies. Featuring women from across the centuries and around the world who have had a remarkable influence, including suffragette Anna Elizabeth Dickinson, Hatshepsut, Florence Nightingale, Anna Pavlova, The Bronte Sisters, Indira Ghandhi and many more. It’s a weird and eclectic selection, including up-to-the-minute influencers, but it attempts to show that women, just like men, have been, and continue to be, shapers of history. Each person is described in a few pages, highlighting what they have done, but also why they matter. The text style is chatty and informative, but also quite dense – there are very few illustrations here. Perhaps a book to dip into, rather like short stories. There are ‘boxes off’ with quotes from today’s young women, talking about what they hope for their own futures: How will You rock the world? If it’s aimed to get the reader researching further, thinking more and making a difference, it works. You can buy it here.